Muhammad Taqi Usmani (Urdu: محمد تقی عثمانی‎, Muhammad Taqī ‘Usmāni, born 1943) (also spelled Uthmani) is a Hanafi Islamic scholar from Pakistan. He served as a judge on the Federal Shariat Court of Pakistan from 1981 to 1982 and the Shariat Appellate Bench of the Supreme Court of Pakistan between 1982 and 2002. He is an expert in the fields of Islamic Jurisprudence (fiqh), economics and hadith. He also held a number of positions on the Shariah Boards of prestigious Islamic institutions, and is one of the most influential Islamic authors outside the Middle East. He is the brother of Islamic scholars Muhammad Rafi Usmani, Muhammad Wali Razi, and Muhammad Razi Usmani, as well as of the Urdu poet Muhammad Zaki Kaifi. In 1958, Usmani passed the Fazil-e-Arabi (Arabic language examination) with distinction, administered by the Punjab Board. In 1959 he graduated from the `Alim course at Darul Uloom Karachi. He then specialised in fiqh (Islamic jurisprudence) under the guidance of his father, the Mufti of Darul Uloom Karachi, Muhammad Shafi, receiving his Takhassus degree (equivalent to a PhD) in fiqh and ifta (issuance of Islamic legal opinions) from Darul Uloom Karachi in 1961, earning the title of Mufti. He graduated from the University of Karachi with a Bachelor of Arts in 1964, then received a Bachelor of Laws with distinction from the University of Karachi in 1967. He received a Master of Arts in Arabic literature, with distinction, from the University of Punjab in 1970. Permanent Member, Vice Chairman, International Islamic Fiqh Academy, Jeddah, organ of the OIC. Permanent Member International Islamic Fiqh Academy, Jeddah, sponsored by OIC. 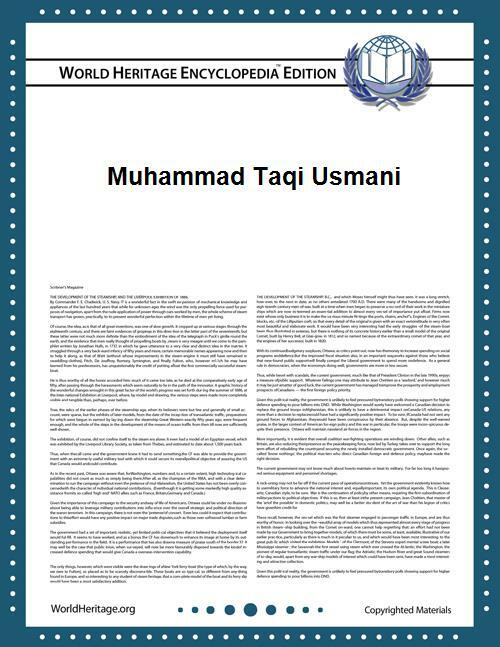 ^ "Shaykh Taqi Usmani Profile". 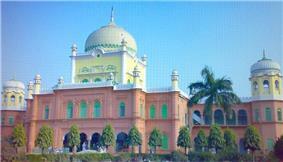 TheMuslim500.com. Retrieved 8 October 2013. ^ a b "Mr. Justice Maulana Muhammad Taqi Usmani". Federal Shariat Court, Pakistan. ^ a b Brian Kettell, Introduction to Islamic Banking and Finance, p 28. ISBN 047097804X. ^ a b "Islamic Finance Scholars". IjaraLoans.com. Retrieved 31 July 2012. ^ a b "Mufti Taqi Usmani". Albalagh. Retrieved 31 July 2012. 4. "Profile". Muhammad Taqi Usmani. Retrieved 24 July 2012.